Some exciting news for you today! It's Blog Hop time!! Today we are CASE-ing (Copy & Selectively Edit) the wonderfully talented Sandi MacIver, who is also joining us on this hop! I hope you find great inspiration from all the projects in this hop. You may be starting the hop here at my blog (Jessie Holton) or you may have come from the previous person on the list. Be sure to click on the next person in the list to continue your blog hop adventure casing Sandi's work. Here's Sandi's card which I have chosen to case. I really love this mix of soft pink against the black! Rather than stamp the background, I've decided to use the new Inside the Lines Designer Series Paper (DSP), which you can earn for free from the Sale-A-Brations catalog with every $90AUD increment you spend on current products in my Online Shop from 4 January - 31 March 2017!! 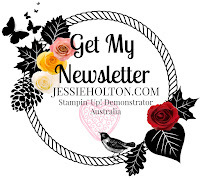 Check out the Stampin' Up! video for the new Inside the Lines DSP here. I have started with a layer of Blushing Bride & a layer of the Inside the Lines DSP. I've wrapped the Blushing Bride Satin Ribbon around them & tied at the front, then I've adhered that to the Blushing Bride cardstock base. Next, I've used the three largest Lots of Labels Thinlits to cut Basic Black, Blushing Bride & Whisper White cardstock with my Big Shot. I've also run the Blushing Bride layer through the Big Shot with the Festive Embossing Folder. I've used the Iconic Occasions Hostess stamp set to stamp the Whisper White layer with Blushing Bride & Momento Black inks before adhering them all together & adding some Basic Rhinestones. I've followed suit on the inside with more of the sentiments & images from the Iconic Occasions Hostess stamp set in Blushing Bride & Momento Black on Whisper White cardstock for a clean, modern take. You can see my product list & how you can earn free Sale-A-Bration items below. Hostess stamp sets are available when you order $250 worth of product or party sales. Ask me for more information on this. I have made this card for my friend Carla, who's just had a baby girl & I hope she really likes it! Please hop around & enjoy all the wonderful projects, casing Sandi McIver's beautiful work! Remember that from 4 January - 31 March 2017, you can earn a free Sale-A-Bration item (just like the Inside the Lines DSP I've used in my project today) for every $90 increment of current product goodies you purchase ($90 = 1, $180 = 2 etc)!